Four years after its birth, the National Co-operative Credit Union (NCCU) is increasing its family. On December 29, 2013 members of the Castle Bruce Credit Union voted unanimously to join the NCCU. At the meeting parliamentary representative for the area, Johnson Drigo, said he was made extremely happy by the move. "This has been long in coming…I am a credit union person at heart; I have served on various committees and this move can only further improve the asset base of the credit union thus further helping members in acquiring their loans," he said. The Castle Bruce Credit Union has been in existence since 1959 and has an asset base of about $4 million with over two thousand members. 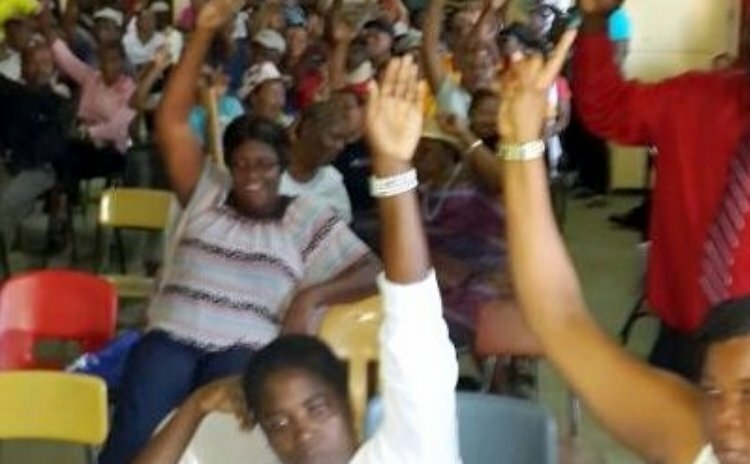 Before this special meeting in Castle Bruce, the board went on what it called "a sensitization drive" to "inform and educate" its members on the proposed move. "We held meetings in the various hamlets like Good Hope, Petite Soufriere and also Castle Bruce to educate and give our members a total insight of what we were proposing. They were given a chance to ask questions and put forward any concerns that they might have had and I can report to you that the meetings held were very fruitful, informative and educational to all," Irving Lawson, President of Castle Bruce Credit Union told the membership. Jacqueline Roberts, the manager of the Castle Bruce Credit Union has been leading the move along with the board of directors and other committee members. According to Roberts, members felt that they needed more services and coming together was the best way forward in the interest of the Credit Union and its members. "In fact lots of persons from the area who are members of Castle Bruce are also members of NCCU and they were doing more business with them. Another issue was that the other credit unions in the areas had done a merger and Castle Bruce was on its own thus weakening our force and we not being able to totally meet some of the needs of our members," she said. She regards the move to merge with the NCCU as "one in the right direction that will bring tremendous benefits to its members." Dexter Ducreay, now the vice president of the NCCU, was at the helm when that institution was formed via the amalgamation. Presently he is part of the NCCU committee that deals with the "transfer of assets". Ducreay explained that this latest "assets transfer" is "critical" and part of "fulfilling the dreams of credit unions of having one credit union." "Members of Castle Bruce who work in town will no longer have to hustle back to transact business. Size is important and with unity you have strength," Ducreay said. He also stated that discussions are ongoing at the level of the Eastern Caribbean Central Bank (ECCB) with the indigenous banks of the region to create one bank. "That is critical to note and hence we are in the right direction for us to compete we have to be big," he said. The NCCU will very soon be meeting its members at a special AGM to have a resolution passed for the transfer of assets.